So where to begin. Let’s start with the one of the last vacations I took. In July, a great friend and often travel companion, Jenn, invited me and other friends to her family beach house in Avon, North Carolina. Every summer during my childhood, my family would spend a week at a condo in Ocean City, Maryland. Those were great vacations, but as I got older, the beaches of the Atlantic coast didn’t hold the exotic appeal of Europe and Asia. But back to the beach in the summer of 2008 – you can’t turn down a free place to stay at the beach and I had just bought a house – money was tight. The southern towns of the Outer Banks are awesome. I’m such a believer. It was like stepping back in time. I was suddenly 12ish years old – enjoying the summer without a care in the world. The towns of Rodanthe (yes, where the movie is set), Waves, Salvo, Avon, Buxton, Frisco, and Hatteras are quintessential small towns. You will see locals everywhere. There is one local grocery store in each town where after a few days, the teenagers at the register recognize you (ok – I go to the store alot – it’s a weird travel habit). The beach is long and the sand is soft. There are no lifeguards, but the surf is manageable. The beach is a national seashore, but one of the perks is that you can drive your 4x4s onto the beach. Nice for not having to lug everything onto the beach. The towns are not that big due to the narrowness of the islands so the beaches are not crowded. A huge plus in my book. There are enough restaurants and other amusements in the area (movie theater, mini golf, cute local shops) to get you out of your house or off the beach for a few hours or nights. Nothing monumental – but hopefully you are too tired from swimming and sunbathing. If deep-sea fishing or scuba is your thing, you will not be disappointed. There are tons of boats for charter and you can dive the many wrecks just off the coast. It is called the “Graveyard of the Atlantic”. 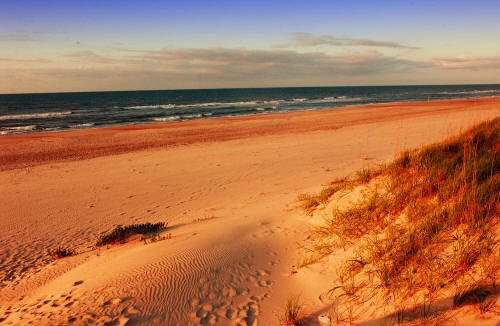 A great excursion we took was the ferry to Ocracoke Island – it has the best beach of 2008. It is only accessible by ferry and has an awesome bar and restaurant called Howard’s Pub – we met the nicest and friendliest people there – both tourists and locals. I hope I get invited back next year – I wouldn’t miss it. This entry was posted in Eastern, United States of America and tagged beach, North Carolina, Summer, United States of America. Bookmark the permalink.